Watching the testimony of former AFPRC junta members, Edward Singhateh and Yankuba Touray, before the Janneh Commission has compelled me to come out and set the record straight. As much as I do not want to pre-empt the forthcoming TRRC, I believe it is incumbent upon some of us to push back on the revisionist history and lies being perpetrated by criminals and monsters like Edward Singhateh and Yankuba Touray. The current government sends a wrong signal to us, the first victims of the AFPRC, when torturers and murderers like Edward Singhateh and Yankuba Touray can roam freely in the country; and in the case of the former, I cannot understand why our government still allows him to represent our country at the ECOWAS. When the TRC commences its proceedings, everything will be clear to the public. It is a mockery to justice to see the way Edward Singhateh and Yankuba Touray sat at the commission and lied through their teeth. These guys brought the culture of torture, detention without trial, and disappearance to our beloved country. There should be no sacred cows or selective justice. We will confront these criminals and ensure that they do not go before the TRRC and tell blatant lies or plead selective amnesia. We will ensure that they are held accountable for the heinous crimes they committed against Gambians. 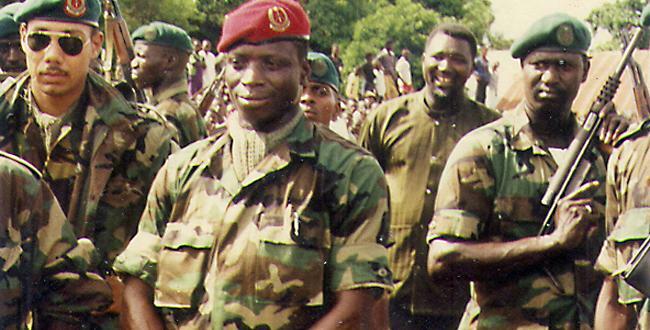 It has been more than twenty-three years, but I have no doubt in my mind that Edward Singhateh and Yankuba Touray are torturers and murderers. That is because I was tortured by them. For now, I will only narrate one episode, so people will begin to understand what we are dealing with. It all started on the night of September 5, 1994. This was day 45 of my incarceration without being charged with committing any crime or being given any explanation for the detention. The first major activity out of routine was the relocation of detainees in Security Wing No.1. The military officers were transferred to our detention wing — Security Wing No 4. The civilians were taken to the Remand Wing. Just as almost anything that happened at the prison, this was unexpected. It was sudden, confusing and unsettling. One would have thought that by now we would get used to things happening without warning. No, this was a strange place with a permanently bizarre culture that defied all attempts at familiarity. Security Wing No. 1 barely stood empty when we started endless speculation about reasons for the relocation. Some assumed that former ministers and senior civil servants of the deposed PPP government were going to be held in there. Little did I know that I was going to be among the detainees who would be isolated there incommunicado, without the basic privileges like taking a shower for months. That night all the members of the ruling council, except for their leader Chairman Yahya Jammeh, drove to the prison for a “visit.” The four lieutenants — Vice Chairman Sana Sabally, Defence Minister Edward Singhateh, Interior Minister Sadibou Hydara, and Local Governments and Lands Minister Yankuba Touray — however, could not complete their tour of Mile Two that night. Apparently, the keys to our cells were kept in a safe in the main prison yard and the senior officer on duty was not available to grant access to the council members to “visit” us in the Security Wings. The precise reason for the duty officer’s absence remained unclear. Considering the humane treatment this officer had accorded us, we speculated that he perhaps had prior knowledge of the council members coming purposely to torture us and so he took pity on us and made himself “unavailable.” But before the council members left, Vice Chairman Sabally ordered for the arrest and detention of the officer for not being found at his post. Regimental Sergeant Major M. Ceesay (Army band), who was in cell No. 25 across from mine, told me that when he peeped through his window he saw Mr. Antou Saidy, the Deputy Commissioner of Prisons, conducting the tour for the council members. We woke up the following day, September 6, 1994, wondering about the fate of the duty officer. Then in a separate development we learnt that Mr. Pierre Marong, the Commissioner of Prisons, had been fired by Vice Chairman Sabally. The reason given was that the council members had ordered him to report to the prison the night of September 5, but he refused to show up on the grounds, because he felt that it was contrary to prison regulations to open the cells in the dead of the night. Then it became clear to me why Antou Saidy was conducting the tour for the council members the previous night. Vice Chairman Sana Sabally considered the commissioner’s refusal to come to the prison grounds an insubordination and removed him as the Commissioner of Prisons. However, Chairman Jammeh overruled the Vice Chairman and reinstated the Commissioner. The officer on duty on September 5 was arrested on the following day and locked up in empty Security Wing No.1. This we found out around 9:00 PM on September 5, when Assistant Prison Officers Famara Colley and Thomas Jarju transferred the officer, who had been their senior colleague until that morning, to our wing. The tension and suspense were palpable in the dense, foul air. The only sound we could hear was the unfailing buzz of a million mosquitoes that invaded us nightly from the mangrove swamps. I was very worried and concerned because this was the only officer who had shown sympathy towards us. I sent him mosquito coils and cigarettes that came from my family. That was all I could do under the circumstance to reciprocate his past favours. I was very nervous and could feel the tension in my body that something sinister was about to happen. Around midnight I dozed off to sleep. In the early hours of the morning, I was awoken by a loud noise. I peeped through the cell door and saw Edward Singhateh clutching an AK 47 and shouting: “Where is Captain M.O. Cham?” Behind him were the other three council members that came with him the previous night, Antou Saidy, who was also dressed in his full uniform, and about forty armed soldiers. I was able to recognize among them Second Lieutenant Peter Singhateh (the younger brother of Edward Singhateh), Private Njie (the Vice Chairman’s orderly), Private Susso, a former Gendarme, Private Batch (Defence Minister Singhateh’s driver), and Warrant Officer II Bah (alias Baaba Maal), who later became a Brigadier and went to America from his diplomatic post in Nigeria. Captain Mamat O. Cham (Now Brigadier General of the GNA and currently the Army Commander), who had been appointed a cabinet minister for only 24 hours by the AFPRC, was occupying Cell No 11. He was dragged out with his hands cuffed behind his back and pushed down on the bare concrete floor. He was kicked with the hard-military combat boots, pummelled with fists and hit with gun butts until he nearly passed out. Then he was dragged through the corridor toward Security Wing No.1. Moments later we heard a round of gunfire, suggesting execution-style shooting. In a split second, the dark place took on a macabre sombreness. Kebba Ceasay, the former Director of the National Security Service in cell No. 25, invoked aloud the name of Allah and the Holy Prophet Mohammed. Everyone in their cell was nervous and felt that the much-feared execution already started. Our fate was no longer hanging in the balance. The junta had ended its debate about what to do with us and decided on a firing squad. Even the high-profile visit from the International Committee for the Red Cross to account for us earlier in our detention, I thought, would not deter the ruling council from carrying out their ghoulish wish. A short while later, the council members and their entourage of armed soldiers came back. The unfortunate target this time was Regimental Sergeant Major Baboucarr Jeng — the most senior non-commissioned officer of the army. RSM Jeng, who had severe neck pain from a car accident during a military training and had to be flown to the United Kingdom for advanced medical treatment, was subjected to the same cruel and inhumane treatment as Captain Cham, before being dragged through the corridor toward Security Wing No.1. Moments later, as expected, we heard another round of gunfire. When they returned for their third victim, Vice Chairman Sana Sabally started shouting my name. I was wearing a sleeveless shirt and a pair of shorts. (With the help of the mosquito repellent my family smuggled in to me, this became my pyjamas after the summer heat became intolerably humid). Lt. Sabally came up to my door, cell No. 14, and showed me his hand with a red stain on it. I concluded that it was blood from Captain Mamat Cham, who was presumably shot dead. “Do you know this,” he asked in a fierce attempt at intimidation. “No,” I replied, already intimidated by what had transpired. The door was unlocked from the outside. Antou Saidy came in the cell and cuffed my hands behind my back. Then I was pulled out and forced to the concrete floor. Combat boots and gun butts hit me with vengeance. I felt pain on every inch of my body. The beating was gruelling, bestial and senseless. I writhed and groaned and helplessly absorbed the brutal violation of my body as they were dragging me through the corridor to Wing No. 1 and taunting me with promises of my imminent death. At this point, I virtually gave up. This was it. I’m about to die. “Be careful!” Lt. Sadibou Hydara, the Interior Minister and my former trainee at the Gendarmerie, shouted to the soldiers who were manhandling me. Why would he caution his underlings to “be careful” with a condemned man on death row only seconds away from a trigger-happy firing squad? I had no idea what prompted him to say that. But it felt like divine intervention for me. His warning to the soldiers was a genuine moment of sympathy that was out of cue of the script, and it betrayed the denouement of the unfolding drama. I was even more scared after he blurted those saintly words. Before that moment I had given up on life and braced myself for death. Now I did not want to die. I wanted to live. My life was back to me before it departed my body. And I did not want to give it up anymore or have it snatched away from me. The soldiers stopped dragging me at the foreground of Security Wing No 1. All my body that came into crashing contact with the hard-concrete floor was severely bruised: my ribs, back, legs, knees, and the handcuffed wrist. While still in handcuffs, Vice Chairman Sabally asked me to say my last prayers before they took me to the execution gallows. Even before I could digest that foreboding prompt and say anything, the Minister of Local Government and Lands, Yankuba Touray, shoved a loaded 9mm French Mab Pistol with the safety catch down into my mouth. I was terrified and lost all the little hope I was clinging to only moments ago. Lt. Touray moved the safety catch on and off with the gun still in mouth. As he kept doing this the entourage of soldiers fired indiscriminately at the sky. The multiple thunderous sounds went on and on. I wanted to die again and get it over with. But the lethal sounds seemed to go on forever, making death inviting. Then the Vice Chairman ordered ceasefire and the guns fell into abrupt silence. I don’t know whether I was relieved or regretful that I was still breathing, albeit haltingly. No amount of words could explain this situation. It was the worst act of terror in the world. I merely stared at these midnight terrorists, mum and numbed. Then Vice Chairman Sabally ordered the Deputy Commissioner of Prisons Antou Saidy to remove the handcuffs. Private Njie pressed an AK 47 on my chest, hauled insults at me to his heart’s content and ordered me to crawl to the cell No. 5 of Security Wing No. 1. After I was locked-up in the poorly-lit cell, he went on to warn me that this was just a mock execution and they would come back at 6:00 PM for the real one in the adjacent gallows chamber. The council members led their entourage of soldiers out of the security wing. Given what could have happened, I was relieved, if not happy, that they abandoned me incommunicado in the cell and left the prison. In addition to the blood-thirsty mosquitoes, starved rats began to roam about. But the insects and rodents would have to do far more to get my attention. I had another chance to keep my life; at least until they returned the next time, as the private soldier who pressed the gun on my chest drilled the grim premonition into my mind. I sat down on the floor of the cell, trying to collect myself from the shell-shock of my brush with death. The effort was pointless. In the theatre of my mind, the encounter played incessantly like an endless loop of the scariest trailer from a horror movie. The only time I had any sense of time was when I heard the call for fajr prayer. Barely dressed in my sleeveless shirt and pair of shorts (now torn due to the dragging on the concrete floor), covered in dirt and bruises, and broken down both physically and mentally to stand, I prayed the fajr sitting down. After almost 3 gruelling years at Africa’s most notorious State Prisons, the Mile II Central Prisons, Ebrima Ismaila Chongan went into exile in England. Like most immigrants, the former Colonel doggedly battled the odds of cultural alienation, worked hard and pursued a career in the legal profession. He now holds LLB (Hons) and LLM in International Law. In 2007, he took the Barrister at Law degree, BL from Middle Temple and only recently, Mr. Chongan was enrolled to the Gambian Bar after his jailer’s regime was defeated in a contentious Presidential election held in December 2016 ending 23 years of ruthless barbarity in The Gambia. Ironically, his tormentors, Captains Yankuba Touray and Edward David Singhateh now walk the streets of Banjul with sickening impunity while the former leader now lives in exile in Equatorial Guinea. Barrister Chongan’s chilling testimony that leaves even the heartless choking is a precursor, potentially and I repeat, potentially, to a Truth, Reconciliation and Reparations Commission (TRRC) established to investigate widespread allegations of torture, state-sanctioned murders, assassinations and disappearances perpetuated by the regime of exiled dictator, Yaya Jammeh. Significantly, many Gambians have expressed total disappointment over the formation of a TRRC instead of a Special Criminal Court to prosecute the utter banditry and wholesale extra-judicial executions, disappearances and torture culture perpetuated by Yaya Jammeh, Edward Singhateh, Yankuba Touray and their military junta. Who is Adama Barrow’s government going to reconcile with whom? is the raging question among many Gambians. How do you prosecute Yankuba Badjie for the alleged killing of one person and try to reconcile with Jammeh’s chief murderers in an elaborate TRRC that is going to cost millions of Gambian dalasis that could build better schools, roads and hospitals? Former Commander of The Gambia National Army and later Interior Minister, General Baboucarr Jatta’s recent media outbursts that former finance Minister, Ousman Koro Ceesay was murdered in cold blood adds dimension to the argument that all former junta members should be prosecuted and held accountable.